Renovator Store stands behind the products it offers – we want you to be completely satisfied that the product performs as it should. All our products have been rigorously and independently tested to meet Australian standards for their intended use. This means you and your trade builders can be confident they will perform as expected. 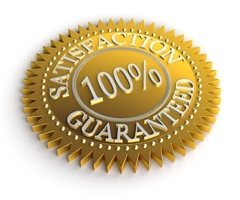 We also use a number of quality assurance steps to target zero faults and mistakes. Of course, now and again something does not go to plan and items get damaged during shipping, or they are not packed complete, or present a manufacturing fault during their warranty period. As an Australian consumer you have protection and rights under Australian Consumer Law. In addition to any rights you may have under law, all our products have a standard warranty period of 12 months from date of purchase, and many have longer manufacturer warranty protection periods as listed on the product pages. We stand behind the products we sell and in most cases will manage warranty claims with manufacturers on your behalf. Check out Renovator Store's Warranty Policy for more details. Detect faults before installation. We require our customers to check their products on arrival and before installation. That way any pre-existing fault can be identified before the product is fixed to your house. Product warranties only cover the product - not it's removal or re-installation. Protect your products from installation risks. Sometimes products are in perfect working order when tested on arrival, but present problems when installed. For example, construction debris in water lines can foul a new tap mechanism on installation – this problem can be avoided by requesting the plumber flush the water lines before they install your brand new tap. If installation instructions are not followed strictly any resulting issues might not be covered by the product warranty. See our RenovatorMate section on product pages for more helpful suggestions to minimise installation problems.